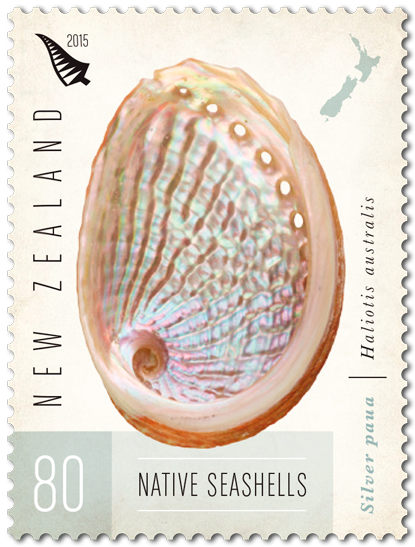 New Zealand’s diversity of seashell fauna can be attributed to our isolation and geological history, allowing for over 2000 native seashell species to thrive in our waters. I was amazed to learn that there were as many as that. 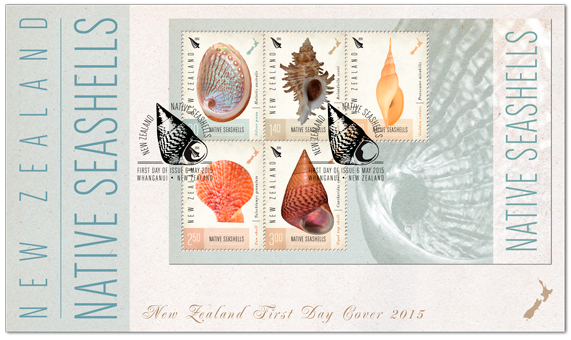 In this issue we see five of these species found only in New Zealand, ranging from the common silver paua to the prized deep-water golden volute. 80c - Silver Paua. $1.40 - Scott’s Murex. $2.00 - Golden volute. $2.50 - Fan shell. $3.00 - Opal top shell. As a nation surrounded by water, seashells are a common sight along our shorelines. Most beaches, particularly the more sheltered harbour beaches have loads of them. 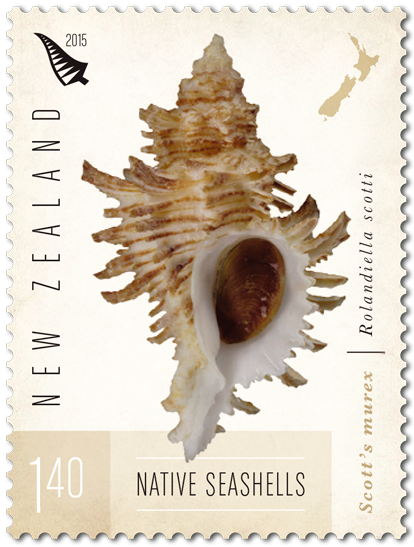 Though for most New Zealanders their interactions with seashells are limited to those they find on the beach and the occasional shellfish meal, collecting seashells is a pastime enjoyed in the coastal regions of New Zealand, with three shell clubs based in Wellington, Auckland and Whangarei. Personally I have not taken a lot of notice of shells on the beach, other than to crunch them under my feet. Maybe I'll take a bit more notice next time I'm at the beach. 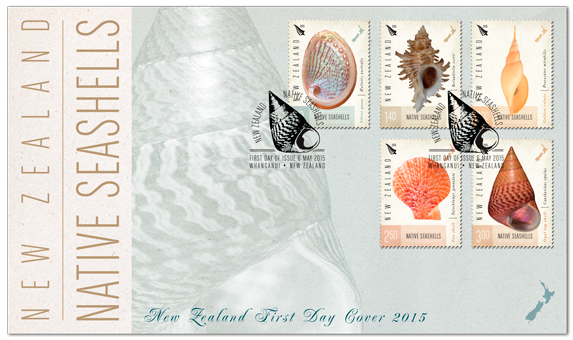 made the shells themselves to be the main feature on each stamp. Well done NZ Post! The silver paua lives in the lowtide and shallow sub-tidal zones on rocky shores throughout the country where it grazes on kelps and other algae. The genus name Haliotis is Latin for sea-ear, reflecting their distinctive shell shape. As Scott’s Murex lives on rocks sub-tidally it can be quite a challenge to find a living specimen. The spines on the shell provide adhesion for camouflage providing organisms like bryozoans and coralline algae giving the shell a pebblelike appearance. 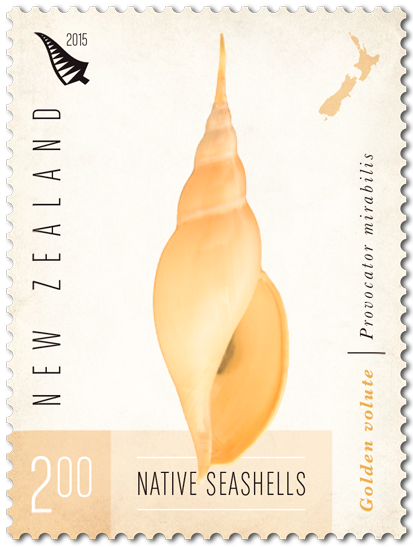 Golden volutes were once considered by many to be ‘New Zealand’s rarest shell’ as they inhabit depths of 400-1000 metres which is well beyond the reach of most shell collectors. 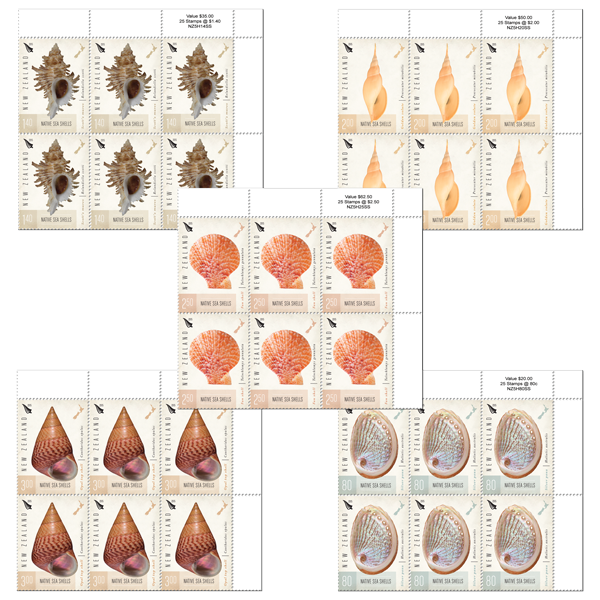 It is rarely found in shell collections and is highly prized for its attractive curves and colouration. 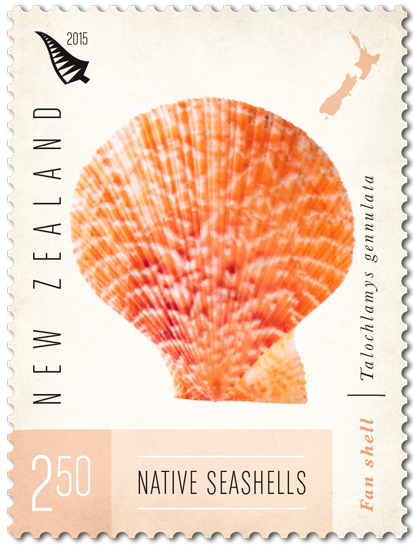 Talochlamys gemmulata is one of two common shallow-water scallops referred to as fan shells in New Zealand. This particular specimen was collected from the Wahine wreck in Wellington harbour and is held in Te Papa Tongarewa’s collection. The opal top shell is a common and attractive species living on rocky shores throughout New Zealand at and below low-tide. 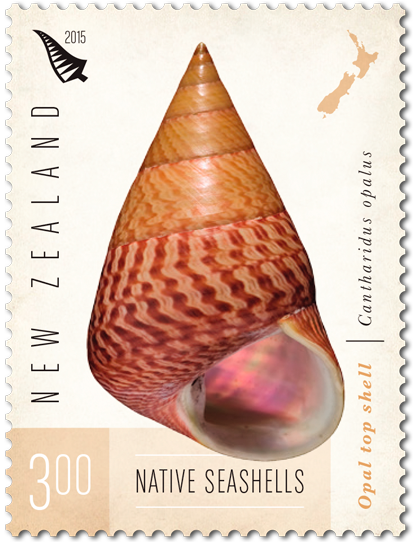 Remarkably, the opal top shell was the first New Zealand animal to be scientifically recorded and illustrated. First Day Covers and Miniature Sheets. The Official First Day Cover complete with special cancel. Above is the Miniature Sheet First Day Cover. Below is the Miniature Sheet. 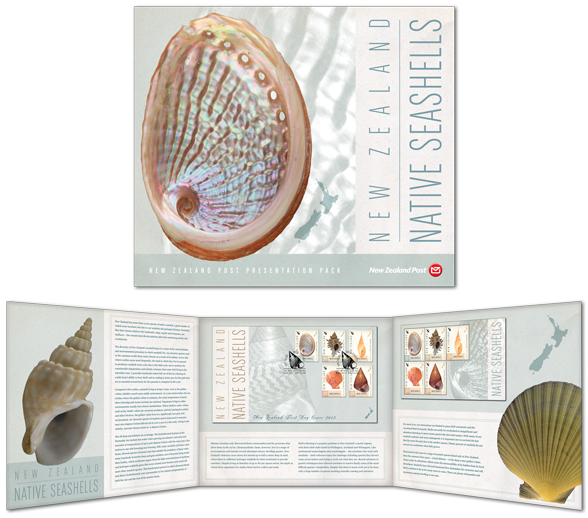 New Zealand Native Seashells Presentation Pack. 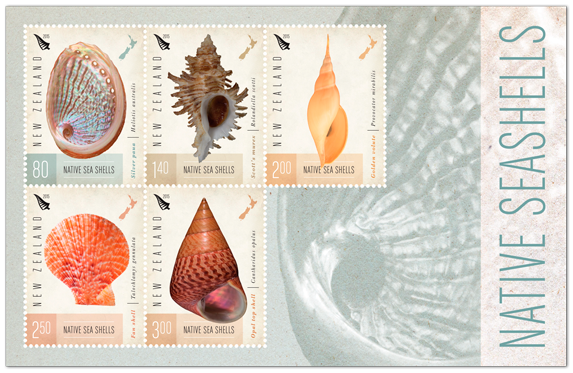 For those who want to learn more about the beautiful marine fauna in the New Zealand Native seashells stamp issue, the presentation pack could be purchased. Included in this pack are the five gummed stamps, plus the first day cover and miniature sheet. 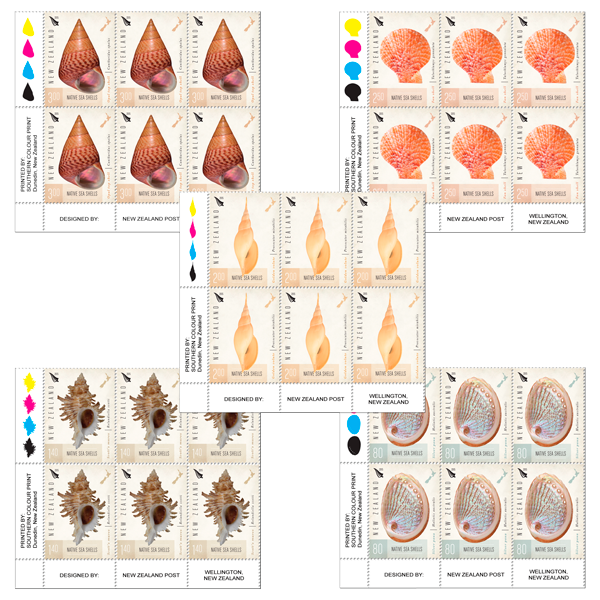 This pack also contains in-depth information about the seashells included in this issue, as well as facts about seashells and their importance in the marine ecosystem. 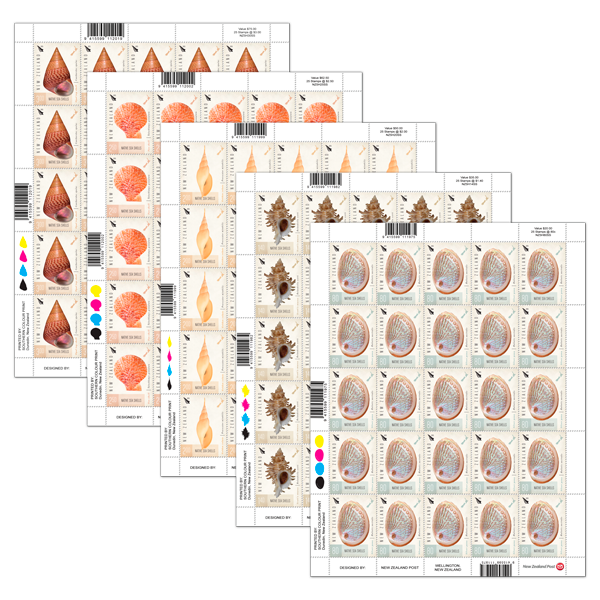 Some collectors will order special blocks of stamps or even whole sheets. Just out of interest I have included the two most common blocks and the range of five full sheets. These blocks show the designer, the printer and printer's colour tabs. the sheet in the top corner. Full Sheets of 25 Stamps. Information on this page came from the NZ Post Official Web Site. Go there to order/purchase these stamps or an extensive range of other stamps and items. 1958 & 1998 - Pania of the Reef. 1894 The Wreck of the SS Wairarapa. 1936 - 1965 - Early ANZAC Issues. 2009 - 2010 Scenic Definitives.